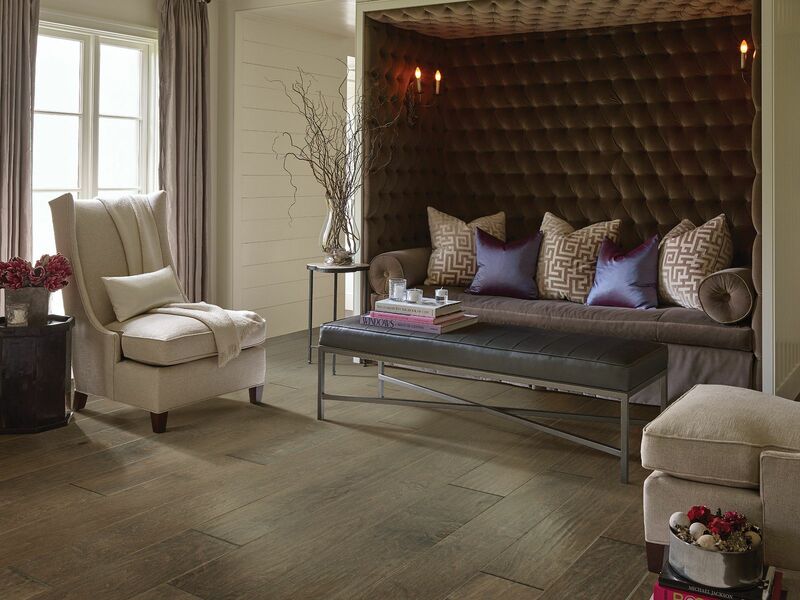 With Shaw hardwood floors, you have several different installation options. Depending on the product you choose, hardwood flooring can be nailed down, glued down, or installed with the floating installation technique. You’ll want to carefully consider your installation options as you make your product selection. Ask your dealer to help you decide what will work best for the specific needs of your home. Shaw offers engineered, EPIC Plus™ engineered and solid hardwood flooring. Engineered is actually produced with three to five layers of hardwood. Shaw's engineered products are made with either a plywood core or a high-density fiberboard core. Shaw does not make any specific recommendations except that it should be a pneumatic hardwood nailer - 2" cleated nails, or use a pneumatic hardwood stapler - 1/2" crown, 1-1/2" long staples. Nail/staple guns used for solid hardwood installation will be a 15 or 16 gauge. For 3/8" engineered floors the minimum staple/cleat is 1"
Engineered floor guns - nail or staple guns used for engineered floors will be 18 or 20 gauge, based on the guns manufacturer. Powernail 2000F may be used to install both traditional plywood core engineered hardwoods and Epic Plus hardwoods using a 1" cleat to install planks less than 3" in width and a 1 1/4" cleat to install planks wider than 3"
Note: Always use a pnematic flooring stapler/cleat nailer that engages the top of the flooring profile over the tongue at the appropriate angle. Make sure that the flooring stapler/cleat nailer is in good working condition and fully seats the staples/cleats properly against the top of the tongue where it meets the vertical edge of the profile to prevent top edge or surface damage. Important: Start by setting the air compressor to 70-80 PSI (or follow the stapler manufacturer's suggested PSI setting). Adjust the air pressure to insure proper setting of fasteners. If splitting damage occurs to the tongue seating area, lower the air pressure. If fasteners are not fully seating properly, increase the air pressure setting gradually until proper seating is achieved. Minor occassional noises within the flooring are inherent to all staple/nail-down installations and can change as environmental changes occur. This is not a manufacturing defect and is therefore not covered under our warranties (see warranty brochure for complete warranty coverage). You can help reduce squeaking, popping, and crackling by being sure that the subfloor is dry, flat, structurally sound, does not have any loose decking or joists, and is swept clean prior to installation. You should also be sure that your stapler/cleat nailer is setting the fastener properly, not damaging the planks, and that you are using the correct nailing schedule. When used improperly, staples can damage wood flooring. If the tool is not adjusted properly the fasteners may not be positioned at the correct angle and may cause blistering, peaking, squeaking, popping, or crackling of the floor. Some models may require the use of an adapter to adjust for proper thickness. Test the tool on a piece of scrap material first - set the stapler/cleat nailer flush on the tongue side of the plank and install a fastener. Should the fastener penetrate to deeply reduce the air pressure; if the fastener is not deep enough then increase the air pressure using an in-line regulator. The crown of the fastener should sit flush at the top of the tongue to prevent damage to the flooring and to reduce squeaking. Shaw is not responsible for damage caused by the mechanical fasteners. IMPORTANT NOTE: Only use manufacturer's recommended staples/cleats/nails. One factor to consider is the type of subfloor currently down in the room in where you want to install your hardwood flooring.